"Your goals are in OUR sight. Get a step ahead of your competition. Train with the best...Where talent and dedication meet." We welcome you to the LAW family. Let your young wrestlers know often that you are proud of them, win or lose, for dedicating themselves to enduring the many hours of practice and drills, for having the courage to step out onto the mat and accepting the challenge of this demanding sport. Take time to thank your parents for giving you the opportunity to participate in this outstanding sport. Thank them for providing you transportation to and from practices and matches, for the time that they have committed to you and for encouraging and supporting you to take and stick with the challenge of the sport. The L.A.W. Wrestling Club is a not-for-profit organization dedicated to fostering, promoting and encouraging the sport of amateur wrestling. It is our intention to build character, physical health and well-being, sportsmanship, self-confidence, self-esteem, and positive attitudes about dedication, persistence, and hard work among the younger generation. Establish and conduct a wrestling club for young people regardless of their socio-economic status. Conduct tournaments, competitions and clinics for wrestlers and coaches. Create a travel team to allow wrestlers to attend wrestling camps, clinics, competitions and tournaments in other geographic areas. Assist wrestlers in obtaining USA Wrestling and/or AAU membership cards to allow them to participate in various wrestling events. Solicit and collect contributions from individuals, groups, business and social organizations, corporations, foundations and governmental entities in order to finance the activities of the Club. Assist individual Club members in attending and in competing in regional, national and international wrestling events. Encourage parents and fans to volunteer their time to assist in the conduct of various wrestling events. Disseminate information about wrestling events and activities to wrestlers, coaches, parents and fans. Disseminate information to the general public about the sport of wrestling. Enhance and support media coverage of wrestling events. 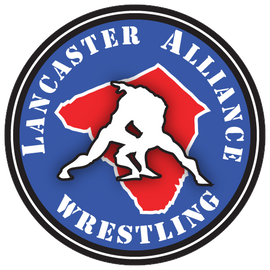 The Lancaster Alliance Wrestling Club LAW is dedicated to unite and strengthen wrestling. This alliance will encourage and develop young men to practice and compete at the “next level” of wrestling. We will provide young wrestlers with basic wrestling principles, work ethic, good sportsmanship, the importance of teamwork, courage, self pride, and the many rewards the sport has to offer. The dedicated coaches of LAW will seek out top-level competition for our athletes. Our promise is to provide a positive training environment where the work is hard, but the reward is well worth it. Send us your pictures!! We want to showcase our LAW wrestlers.